The original map is with the Norwich Records Office, Ref no. MC22/11. A full size copy of the complete map is displayed in New Buckenham’s village hall, funded by the New Buckenham Society and the High Bailiff’s Charity in 2010. The Society is most grateful to Paul Rutledge for his scholarly description of the map. 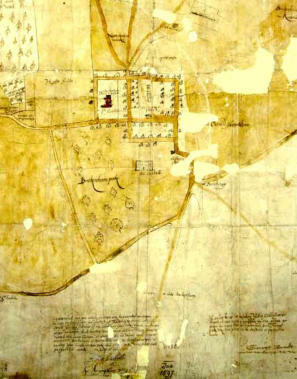 This is a copy of a map made as evidence in one of the squabbles between New Buckenham and Carleton Rode about commons. New Buckenham claimed common as far as the crossroads and Carleton claimed to share the bit between the present end of the common and the crossroads. Carleton eventually won. The top of the map is to the east, towards Carleton Rode, but we begin at the west end where the castle is shown in its wooded park. Beside it is Clifton’s cha[pel] and the Dambrigge then a simplified plan of New Buckenham (no Marsh Lane!) with stalls on the market place and the church ‘called St Martins’. Then the common with the old claypits (still to be seen), the beck described as the ‘fall of the water from the woods’, Spitle crofte (perhaps the site or the property of a medieval spittal or hospice), and an old mill hill (still visible just south of the common), then the Haugh field, New Buckenham’s big town field, ‘in sundrie parcelles’. The road to Tibenham, long ago gone, is also marked. The eastern (top) boundary that is now Cherry Tree Road and Upgate is shown in especial detail as the area ‘at variaunce’. It had various names; procession way because of beating the bounds, green way, and Hundred mere because it was the boundary of the ancient boundary of Shropham. Other names include ostroke and Goldlocks corner, perhaps marking outstanding oak trees. There is also a sheep mere, a sheep watering place (mere had two meanings, boundary and pool). Returning on the north side another shared field, High Field, then a big wood called Harling Wood otherwise known as Buckenham Wood (Harling because it had once belonged to the manor of East Harling), then the boundary passes down by Wattes Lane, now Harlingwood Lane, through a green called Condals green and also through the middle of the former parish church of St Andrew ‘now a barne’ which was somewhere on the site of Old Buckenham Stud. The procession lane brings us back to the Dambrigge whose name means embanked causeway. ‘Carleton Common 1000 acres’ is noted wryly at the top left-hand corner of the sheet.